The Arc’teryx Nuclei AR Jacket is a one-pound (men’s size M) synthetic belay jacket designed for wet conditions. The highly water-resistant Gore Thermium shell and Coreloft insulation promise protection from light rain and snow, and continued insulating performance should insulation become damp. We tested the Nuclei AR over a winter season of rock and ice climbing. The Nuclei AR boasts high tech materials and impeccable construction. The Gore Thermium outer shell combines a highly water resistant, wind resistant and breathable membrane with full seam taping. This combination hedges the outer shell much more towards weather resistance than breathability. Arc’teryx insulates the Nuclei AR with two weights of their proprietary Coreloft, a crimped and siliconized polyester insulation. The hooded jacket is finished off with a quilted liner. Arc’teryx reinforces its reputation for high-quality with the Nuclei AR; every aspect of construction is visibly of the highest caliber. Seams are laser straight, and allowances are tiny (a claimed 1.6mm of seam allowance), no loose threads, no extraneous gaps or material ends. Our men’s medium Nuclei AR stuffed into a tight 9” x 5” x 4” package, the Coreloft insulation proved to be one of the most compressible synthetics. Unfurling the jacket revealed the crinkly nature of the Gore Thermium outer shell, deep wrinkles took a while to disappear. 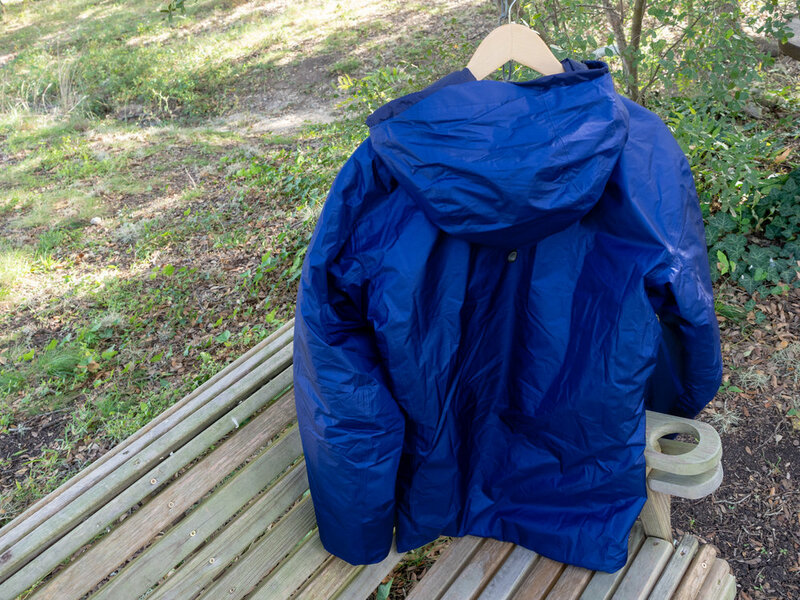 Donning the jacket immediately revealed the near windproof nature of the outer shell. The insulation lofted quickly with movement, and it was soon apparent that the Nuclei AR is indeed a warm jacket. Temperatures just below freezing, with appropriate climbing layers underneath, didn’t penetrate. Neither did dripping water, light rain, or snow. The fit of the Nuclei AR for this tester was phenomenal. I am six-feet tall, 167 pounds; the jacket fit across shoulders without being a sail in the torso region, commonly an issue for me. The gusseted underarms and articulated allowed proper sleeve coverage without binding in the full range of motion possible by the shoulders and arms. I appreciated the low drop rear hem during long belays of sitting or leaning against cold stone or ice. The fit of the Arc’teryx Nuclei AR proved to be one of the best in my extensive collection of insulated jackets. Breathability was limited; the Coreloft may be highly air permeable, but the characteristics of the outer shell made the Nuclei a logical choice for belaying and downhill skiing, but not for more active pursuits. 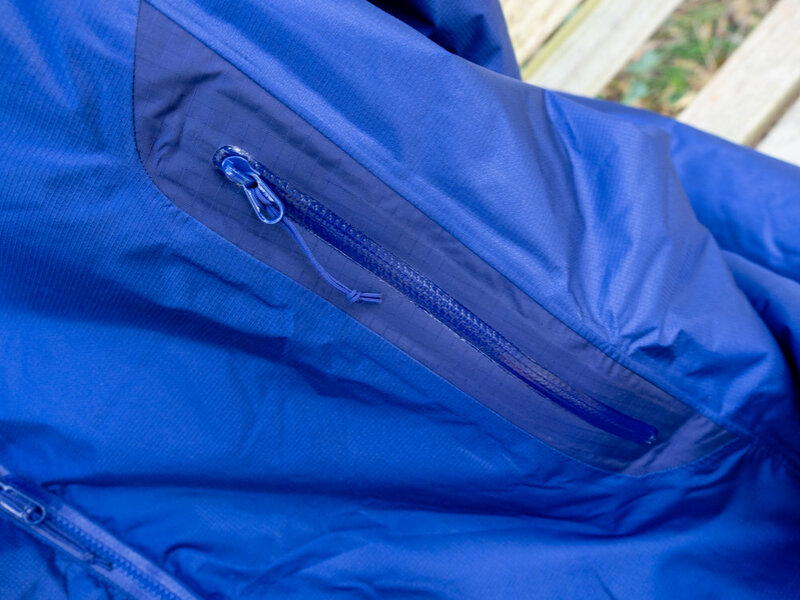 The lack venting options other than the main zipper further limited uses beyond stop and start activities. As a belay jacket, the omission of a few key features was apparent. First and foremost was the lack of a two-way main zipper; adding this function would make clearing the tie-in point of the harness a non-issue. The single interior mesh pocket, although functional for keeping snacks from freezing and drying gloves, desperately needed a twin counterpart. Having two interior dump pockets dramatically facilitates drying gloves, and reduces the chances of dropping one. This tester is not convinced that the weight savings of either the two-way zipper or single interior pocket is worth it. I also found the visor to me way too small to be of much use. I did appreciate the simple elastic wrist closures; they didn’t catch on gloves, which made transitions when gloves stayed on frustration-free. The Nuclei AR proved durable throughout the testing period, rocks, climbing hardware and haphazard treatment unable to produce any visible damage. All zippers, drawstrings and related parts work as well as on the first day. The Arc’teryx Nuclei AR provided great warmth and protection from drips, light rain, and snow in temperatures just below freezing, functioning well as a belay jacket, with a few caveats. The lack of a two-way main zipper for a belay jacket is a significant oversight, and the single interior pocket a minor one. The Nuclei AR is also somewhat in limbo as far as being defined by a “category” of insulated shell. It is NOT waterproof (although it is seam taped), and it has limited breathability. Weather resistance vs. breathability is a typical tradeoff, but the Nuclei AR doesn’t benefit from being predominantly on one side or the other. The low breathability and lack of waterproofness, combined with the high price (MSRP $425) could be a deal breaker for some. But, the warmth, low weight, high compressibility, impeccable construction, and high wind resistance of Gore Thermium may sway others.